It’s been a great summer of sport with the Commonwealth Games, golf (what a fab Ryder cup), cricket and the European Athletics Championships. My husband gets annoyed when sports people say they’ve given 110%. If you put 100% into something, by definition, that’s everything you’ve got. There is no more. When it comes to eating well, how far are you prepared to go? Do you need or want to eat 100% good things? Recently, I went to a delightful concert with tea and cake at Higham Hall. A gentleman who had heard one of my talks watched with interest to see whether I would indulge. Knowing that a cream scone once in a blue moon wouldn’t do me too much harm, I had one (well, half of one). I ate it mindfully and enjoyed it very much. Like sports people, the % effort you put in depends on what you are trying to achieve. If you have serious health problems, then it’s worth putting serious efforts into supporting your body by eating all good, nutrient-packed food. If you’re healthy and feel great, you might take a more relaxed approach. What if you’re in-between with a few niggles, an expanding girth, declining energy, but nothing drastic? First, think about your physical state and the importance to you of it being better. Second, estimate current percentages of natural food and processed food you eat. Marketing is so subtle and devious that you might not even be sure which foods count as good and which as bad. Low-fat fruit yoghurts are a classic processed food posing as a healthy choice. Third and last, decide what you are willing to do to improve your life. Choose a level that gives you some benefits and that you can sustain. Top tip – You decide how far you want to go. The lovely stats helper monkeys at WordPress have put together an annual report for the Learn to Eat Well site. In 2012, there were readers from 49 countries, mostly in the UK with the US and Brazil not far behind. People were most interested in the page on Courses for Individuals and Groups. The most popular post was the first one on 15th Jan – ‘No Quick Fix’. It’s still true of course that there is no quick fix to looking after your health and well-being. It’s a life long commitment to a long life! To help inspire you, how about watching Channel 5’s ‘50 shocking facts about diet and exercise’. Entertaining, attention-grabbing and containing a lot of very sound information, I really enjoyed it. In the middle of August, I was up a mountain in France as a member of the GB team, competing in the Field Archery World Championships. Before I went, I wrote about what I might eat. Lots of people have views on what is required for sporting performance eg carb loading or energy drinks. Similarly to healthy eating, we are all different when it comes to our ideal fuel for sport. I have tried out lots of ideas over the years to find out what helps me feel good for the 7 or 8 (in France 9 or 10) hours of a competition day. My food of choice when competing in Britain is sprouted mung beans, celery and cheese. We stay in bed and breakfasts so enjoy the benefits of a full English breakfast to start the day, from which I save the sausage to add to my lunch. I always have a bag of nuts with me with some pieces of protein bar mixed in. I take bottles of plain water to drink. Competing abroad means thinking about how to get what I need as a high protein metabolic type. I know that full English will not be on the menu at Val d’Isere but I’m hopeful of cheese and ham. Lunch is trickier. The 2009 European Championships were also in France and they bombarded us with bread several times a day. Staying in the middle of nowhere, I had no choice but to eat it and suffered as a result. I love the taste but have learned that bread does me no favours. Actually lots of people struggle with bread and most of those don’t even realise that it’s a problem for them. If you think this might apply to you, try cutting it out for a couple of weeks and notice what happens when you add it back in. So this year I’ll take a range of emergency supplies and go shopping as necessary. Wish me luck! Top tip: Learn what suits you and your sport. It’s true that bread was available in vast quantities, but I didn’t have to eat any because the food at the Village Montana hotel, Tignes was superb. I started each morning with a shot of wheatgrass juice (from Tonic Attack) before a splendid breakfast of fruit, natural yoghurt, ham, cheese and boiled eggs (most days the weather was too hot to eat bacon and fried egg but it was available!). I took bread-free packed lunches. Evening meals were salads, meat, fish and vegetables. Brilliant. Glad to have eaten well on this, my last trip with the GB team. Photo by Gerard Zonjee of http://www.fieldarcher.org – pics and reports of international field archery events. Most of the advice we get about what to eat is either well-meaning ‘one-size-fits-all’ generalities or advertising aiming to make us buy products. As an international archer I received advice some years ago from a nutritionist that came under the first category. Unfortunately eating in the way that is currently fashionable as healthy was not right for my body chemistry and I ended up overweight with a whole load of other problems. 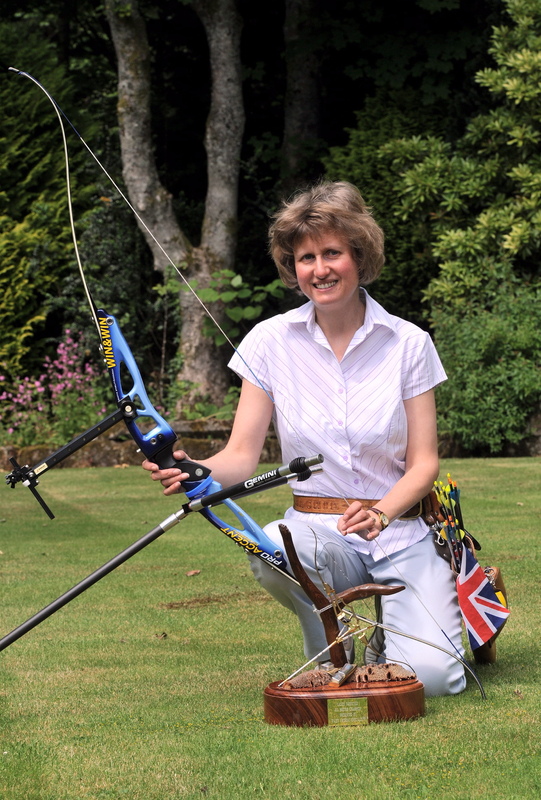 I’ve just won the British Field Archery Championships for the 6th time. At the age of 47 and with a 7 year gap since my last British title, I’m delighted. My good shooting this year (including a lifetime best score indoors) is the result of a combination of factors. Using my record charts (described in my book Succeed in Sport, train-learn-adapt-improve), I made a change to my weight training pattern. I also reviewed my performance profile, prioritised and following a great day with Lanny Bassham at Bisley, made some tweaks to my mental approach . And I benefitted from a reduction of work related stress. I believe that eating right was another key factor. Field archery competitions last for two whole days. Many foods loved by sports people (chewy bars and artificial drinks) provide a swift energy hit followed by slumps, hunger, headaches, mood changes and weight gain. Other foods (like sandwiches) take a lot of energy to process and leave you sluggish in the afternoon. I wanted food that would digest itself and give me the nutrients I wanted to keep going steadily for many hours. Among other things, I take fresh coconut, cheese and the magical sprouted beans and seeds. They’re cheap, easy to grow and bursting with goodness. Anyone who has been to one of my talks will know how much I love live food and the enzymes they contain. Foods like this have a high water content; wet food is better at keeping you hydrated than dry food plus drinks. You might have been put off by the recent E coli outbreak in Europe which was suggested (although not confirmed) to have come from fenugreek, mustard and rocket seeds from Egypt sold via a British company. The company believes the infection is more likely to be due to how the seeds were used and handled than the seeds themselves. Here, the Food Standards Agency, as a precaution, is recommending that sprouted seeds are eaten cooked rather than raw. That would kill all the enzymes that you grew them for in the first place. I leave you to make up your own mind but if you do grow some, make sure you always wash your trays properly between batches so you don’t end up with bacterial contamination.